This Buddha bowl recipe is full of healthy plant-based ingredients and works great for meal prep! 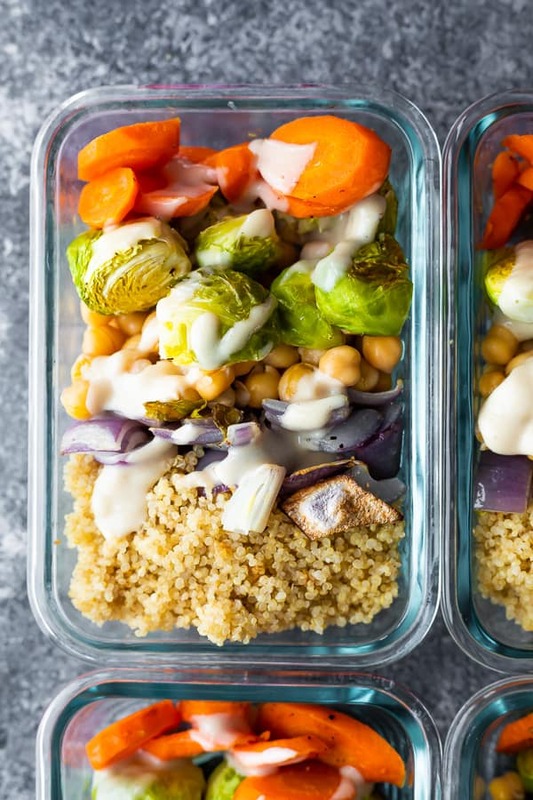 Customize it using your favorite veggies and don’t forget to drizzle with the delicious tahini sauce. It’s about time my favorite Buddha bowl recipe got it’s very own recipe post on SPS! I have actually been making this recipe since 2017 and it is one of my go-to recipes. What is a Buddha bowl? I am going to refer you to this article from Bon Appetit if you are really curious about the origin of the name. My definition of a Buddha bowl is a bowl filled with healthy plant-based ingredients: a grain (or seed as we’re using quinoa for this recipe), some veggies, a protein (chickpeas in this case), and healthy fats (thank you tahini sauce). Today’s Buddha bowl recipe is perfect for meal prep. It is vegan, gluten-free, and brimming with healthy ingredients that still taste great on day 4. For this recipe, we have three main components: grains, veggies and sauce. Even with three recipe components, these Buddha bowls are ready in under 40 minutes! cook your grains– in this case we are cooking quinoa (which is technically a seed). 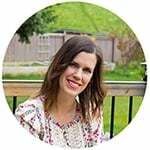 Check out how to cook quinoa in a rice cooker! 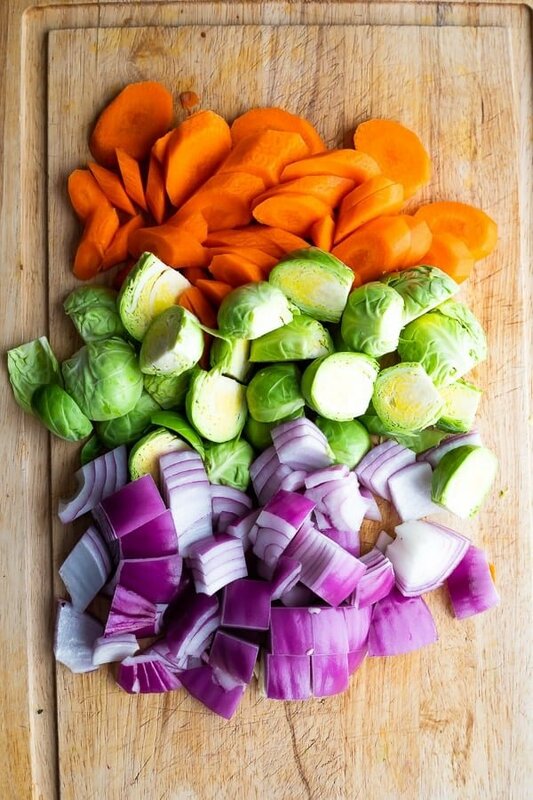 roast your veggies– I chose carrots, brussels sprouts and red onion. You can dig through your fridge and see which veggies you have and swap them in! 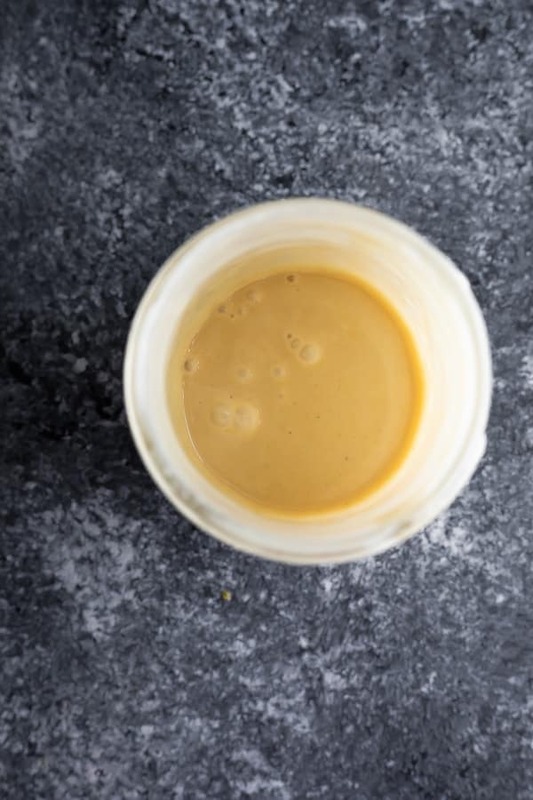 shake up your sauce– super simple: tahini, water, maple syrup and lemon. It is creamy, tangy and the perfect compliment to the other ingredients. Assemble, add some canned chickpeas, and you are set! Do you eat this vegan Buddha bowl hot or cold? That is completely up to you. 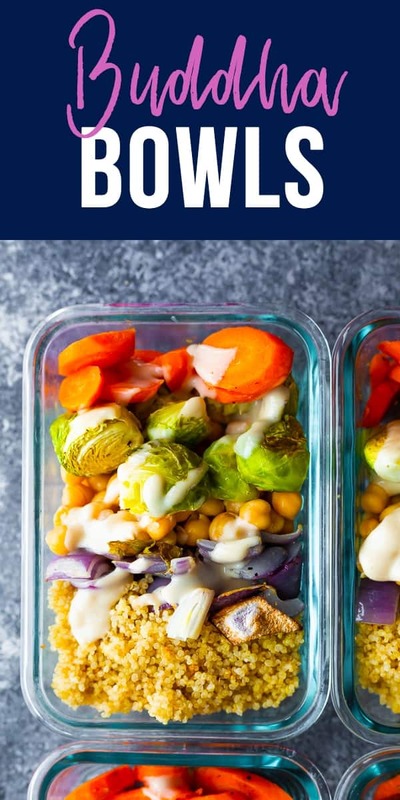 I have done it either way and I think I prefer it warmed slightly in the microwave (it helps the tahini sauce loosen up a bit). Can I change up the flavors in this vegan Buddha bowl recipe? Absolutely! Why not add one of these spice blends to the veggies, or add some flavor to the quinoa using one these 7 rice recipes (the water: grain ratio is the same so you should be able to use the same measurements). You can also change up the sauce. I love this green goddess dressing! Can I swap the chickpeas for another protein? Yes! I bet tofu would be great in this recipe. Here’s my favorite easy baked tofu recipe. Can I freeze these vegan Buddha bowls? It comes down to personal preference…I do not care for frozen roasted veggies as I find they end up slimy. If you don’t mind, then go for it! I would keep the tahini sauce separate though. This Buddha bowl recipe is full of healthy plant-based ingredients and works great for meal prep! 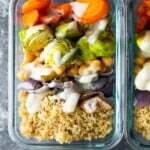 Customize it using your favorite veggies and don't forget to drizzle with the delicious tahini sauce. Cook quinoa according to package directions. Portion out into four 2-cup capacity storage containers and allow to cool. Heat oven to 425°F. Line a baking sheet with parchment and set aside. Toss carrots, onion, brussels sprouts in olive oil and season with salt & pepper. Spread out on the baking sheet and bake in the oven for 15-20 minutes, stirring halfway through, or until veggies are soft. While veggies are baking, shake together all tahini dressing ingredients. 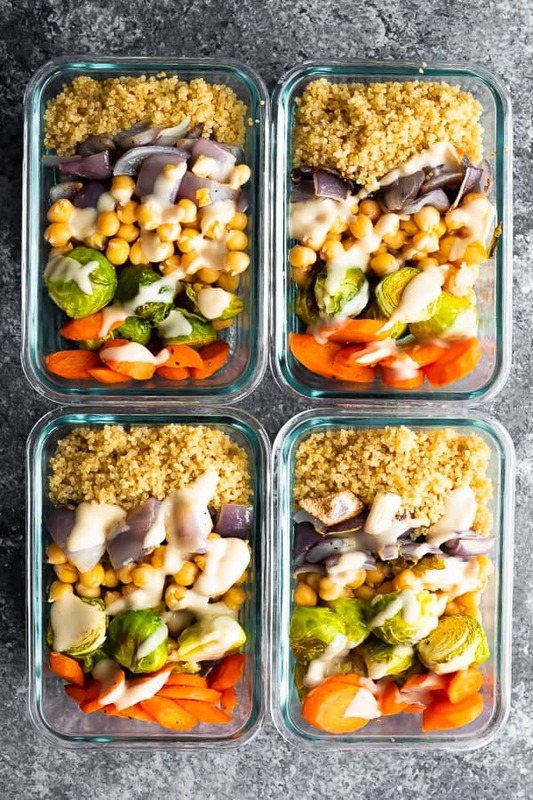 Between the four meal prep containers, portion out the chickpeas, veggies, and tahini sauce (you can drizzle right away or add it to a condiment container to add fresh). Store in the fridge for up to 4 days. Reheat until steaming hot, or enjoy cold. I made this twice and really enjoyed it! My grocery store didn’t have tahini, so I had to use almond butter instead. It came out tasty!